A few months ago I decided that I wanted to chat with potential Credo inquirers and pros. 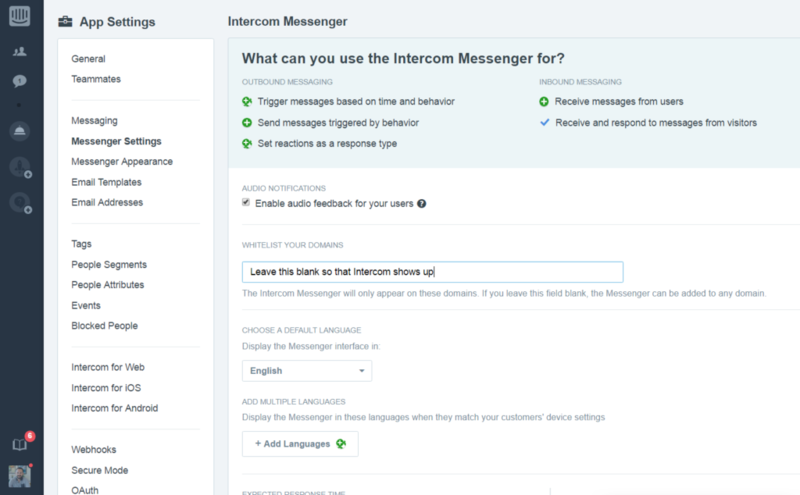 After investigating some options (and I think Tom’s FB Messenger hack is really cool), I decided to go with the industry leader Intercom. For all of its merits (and there are many), Intercom lacks one major feature for it to work swimmingly for those of us who might be traveling in time zones (sometimes very) different from our normal. That feature? The ability to specify office hours so that the chat only shows when I am available. I am a solo entrepreneur who is not interested in hiring a lot of people to do specific tasks. I like to run my company lean and only use contractors when something needs to be done that I either a) do not have the time for but it requires dedication, or b) do not have the required skills. All Credo pros have my personal email address where they can directly email me with questions. Both my personal Twitter and Credo Twitter accounts have open Direct Messages. I regularly hop on the phone with Credo pros to get their feedback on the product and answer their questions. This has been great. I’ve connected with people, answered their questions, and converted some to inquiries directly to pros. Those are wins. There are a few things I have to tweak with Intercom to make it work for me as a traveling entrepreneur, and the first is the inability to specify office hours. I am currently traveling internationally and spending time out seeing new places, which means that I do not always have Internet access. 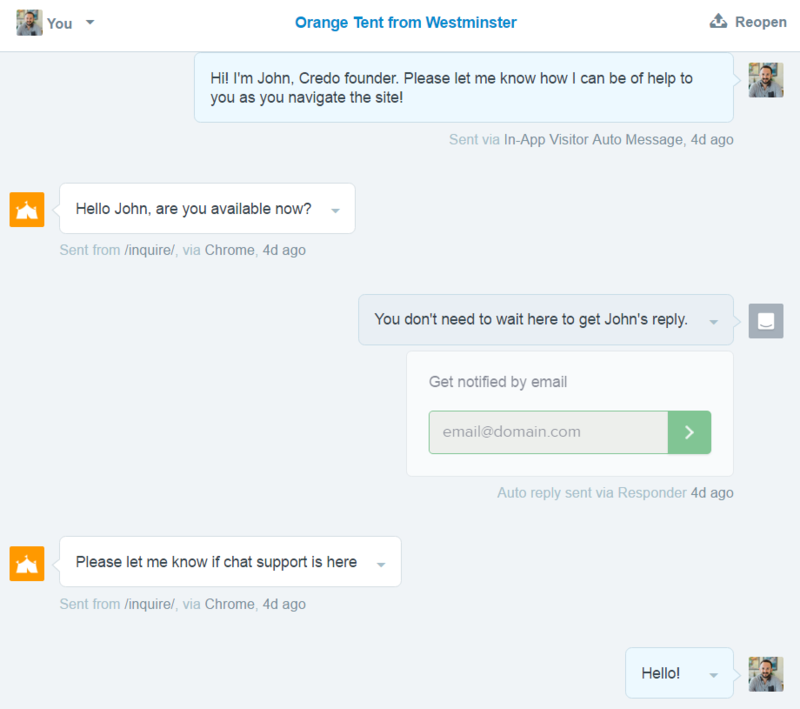 I want to be able to provide the best support for my customers (pros) and potential businesses, which means that I cannot just let be shown when I am not online, as chat means “I am available now”. Who knows who they were? Maybe they are a Credo Pro, or maybe they are looking for help finding someone. Regardless, they didn’t get what they needed and left with at best a neutral view of Credo and likely they left with a semi-negative view. So what am I doing to alleviate this? I asked the team over at Intercom if they have this feature, and they said that they don’t even though it has been requested many times. Likely not a good sign. There is a relatively quick way, however, to turn Messenger on for your site when you are at your computer and off when you are not available. And honestly, I think this is the best of both worlds for me since I also believe in work-life integration and do not want to always be at the beck and call of a messenger app on my phone. If you are in the office, make the “Whitelist Your Domains” field empty. If you are not in the office, put anything in that field and save your settings. Now, you can respond to support messages when you are in the office. If you are not in the office, support will not be available (unless you have an alternate route like an email form, which is probably something I should implement too). I actually really like this solution because I do not have to remember if I am supposed to be online or not because I have specified certain hours. Because I travel quite a bit and often am not available and want to flexibility to go see something in the morning and then work the afternoon, I do not want to commit to specific hours every day that I am online. Business to me is about freedom and doing well for others, and that is not hour-specific. Do you use Intercom as a business or website owner? What hacks have you come up with to use it well for your business?